Instagram, the widely popular image based social media platform, known for its celebrity selfies, food bloggers and ‘insta-famous’ brand promoters is also being used by artists around the world to great success. The site is launching careers, keeping artists relevant, and changing the way audiences engage with the art world. Since its introduction in 2010, Instagram, with its hyper-engaged audience and image centric layout, has become a social media staple. For artists the platform offers another possibility: journaling their work online and marketing themselves to the world. Many of them, both under the radar and established, are using it to their benefit and in a lot of cases Instagram has become essential to their careers. 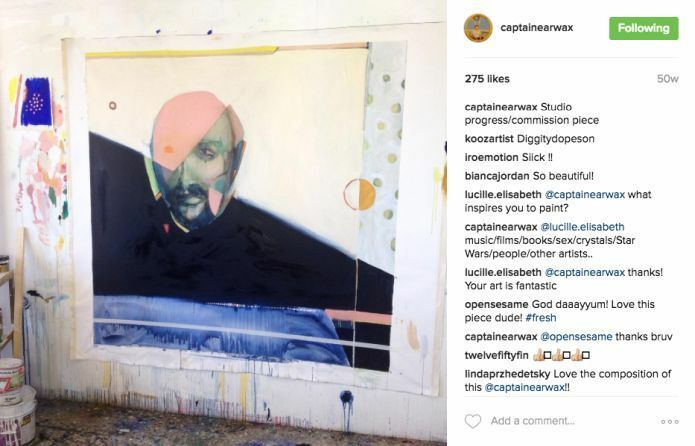 WHY DO ARTISTS LOVE INSTAGRAM? O’ Toole is correct with his assumption. According to Brandwatch, as of May 2016 Instagram had 400 million active users. Of that number 90 percent are under the age of 35, and 60 percent are logging in daily. This makes Instagram the second most engaged network after Facebook. Pair this with a stream of artists who are posting their work daily and one gets a generation of youth who are engaging with the art world in ways that have never been seen before. The established art culture is shifting, and the importance of agents and galleries is slowly diminishing. With Instagram, artists are able to market their own work and sell directly to their followers. In fact, Instagram has proven to be an amazing marketing tool for all types of brands. According to a study by Locowise, 50 percent of Instagram users follow at least one business, with 75 percent of them taking action when they see a product post, such as visiting a website. Now that artists are marketing themselves, galleries, agents and other middlemen are losing their relevance. By creating their own personal brands and selling directly to their followers, artists have more power and less concern about giving away a cut of their profit. 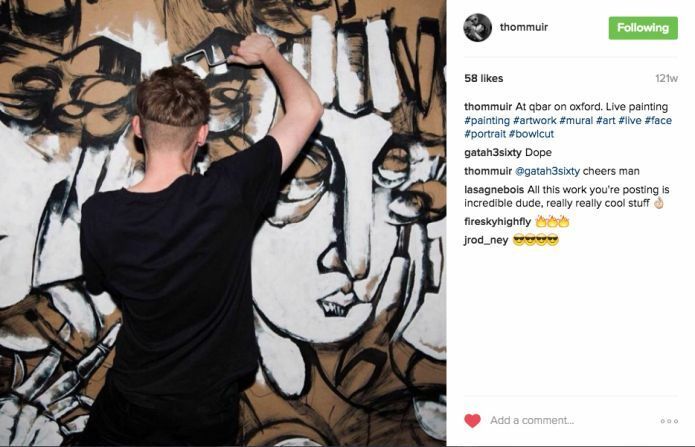 Thom Muir showcasing his art on Instagram. | © Thom Muir on Instagram With this change in how audiences are connecting with art, some theorists and curators are worried about about works losing their integrity. O’Toole says, “I’ve got friends, curators and others that hate Instagram and their reasoning is that it’s the destruction of image, devaluing the importance of image because its this mass consumption and saturation”, but he is quick to add that he doesn’t share his friend’s anxiety. Instead saying that his only worry for the future is that an artist’s practice may become contrived if they begin making work simply to look good on their Instagram accounts. One thing is certain: the established ideas of how artists market and exhibit their work are changing. The art world is moving forward on unfamiliar terrain, and with the rapid evolution of new technologies, only time will tell what the future holds. “I don’t think that Instagram is the future of the art world, but it is the first step in a different direction”, says Muir. Chloe Michele is a writer living in Sydney, Australia.